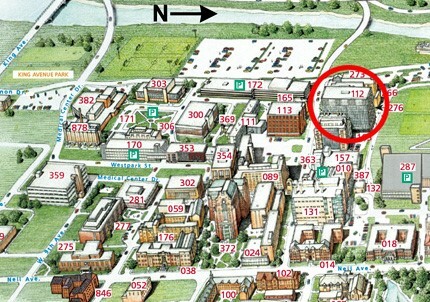 Enter the BRT from 12th Avenue at the west end (red arrow). Turn right at the large hallway and at the gray double doors scan your ID card. If you do not have access to the BRT call the CMIF at 292-9786 and someone will come down to let you in. 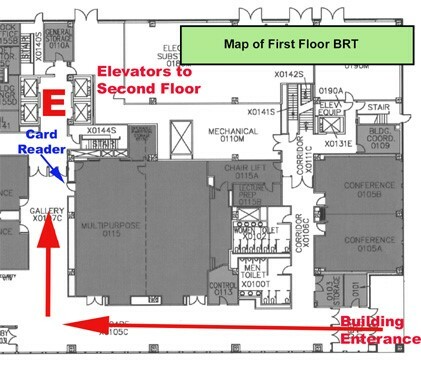 After you have scanned your ID card and entered the elevators area, proceed to the second floor. 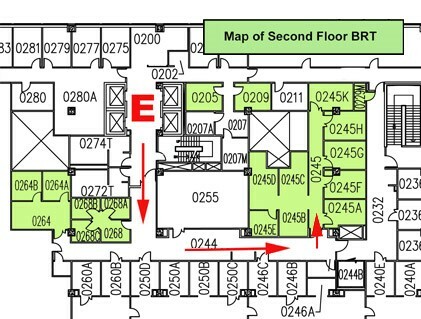 The Second floor map shows the elevator area with a large red E. Follow the hallways indicated by the red arrows. Walk past the Women's and Men's room through a large wood door. Turn left and walk down the hallway to room 245.